In the French eastern region of Meuse, three hundreds to a thousand people rallied this Tuesday against a Cigeo -short name for nuclear waste landfill facilities. After the march was quickly stopped by authorities, demonstrators clashed with police in the nearby village of Saudron. Repression was severe. The cops used tear gas and a water cannon, seriously injuring six and lightly wounding thirty. Cops were met with Molotov cocktails and rocks. ‘les ZIRAdiees’ Twitter page published a series of pictures and said the gendarmes clearly put pressure on the march which had started in a peaceful atmosphere. Reports say that some policemen were seen carrying Famas automatic weapons and fired rubber bullets. The project is under review by the French Nuclear Safety Agency (ASN) which declared it has reserves. The facilities would be built by Andra, the French national agency for the management of nuclear waste starting in 2022 and is very controversial for many such as environmentalists. 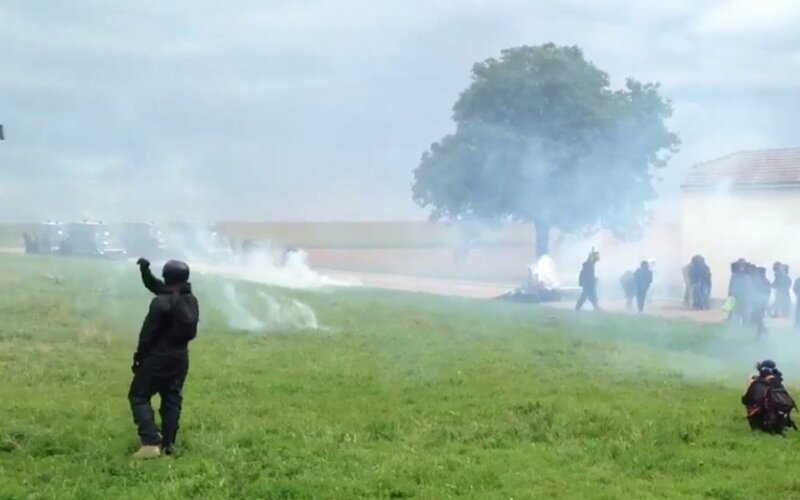 Similarly to the ZAD in Notre-Dame-Des-Landes in the western part of the country, the site has been occupied by activists for several months. They have set up camps in the Lejuc woods denouncing a ‘nuclear garbage can’. During the festival ‘des Burlesques’ that took place during the weekend prior to the march, one banner said ‘Andra we will evict you’ and activists showed solidarity with Heather Heyer, the anti-racist protester killed in Charlotesville, USA.